The Geecoo G1 was released in December 2017 by Geecoo, the company makes very affordable smartphones with value for money. The device has been the go to phone for those on a budget, lasting longer with 3000mAh battery. The display is also one of its highlights, i’ll talk more about that below. Lets see what the Geecoo G1 have in store for us today. Care to join me? A beauty with a metal mix body, the Geecoo G1 doesn’t look cheap. It has a smooth back that is very comfortable to hold, operate and flaunt. The rear camera is at the top middle with the LED flash underneath, while the fingerprint scanner completes the vertical train. The Geecoo logo follows to add a unique flair to the back of the device. There’s no rear speaker anywhere at the back, moving to the sides, the volume keys and power button are present. It measures 9.8mm slim as well, which is very bulky. Furthermore, it’s available in Blue, Gray, Red, Black and Gold colors. It isn’t necessarily bezel-less, because the top and bottom bezel are pretty much visible. Although the the narrow are no longer visible, dishing out a much taller display when in landscape mode. It’s also important to note that the top bezel houses the selfie camera and front LED flash. Focusing on the screen now, 5.34-inch AMOLED On-Cell capacitive touchscreen is perfect for its price. The screen boasts of 960 x 480 pixels in resolution and 201 pixel per inch density. Protecting the screen is a 2.5D curved screen, while the display got to 66.97% screen to body ratio. It houses the Spreadtrum SC983 chipset with Quad-core processor clocking at 1.3GHz. It has a 64-bit CPU architecture, 28nm process technology and 1GB RAM for light multitasking. The graphics processor is the ARM Mali-400 MP2 processing unit, which reaches a maximum speed of 512MHz. Save your favorite games, apps, files and movies in the 8GB internal storage space. It that isn’t enough and you want to expand, you can expand up to 32GB using a memory card. The G1 runs on Android 7.0 Nougat operating system with modified user interface. The 5MP rear camera with f/2.2 aperture captures 2K resolution images. Photographs taken with the device boasts of 2582 x 1936 pixels in dimension. It comes with dual-LED flash as well with other quality features like touch focus, autofocus, continuous shooting, digital image stabilization and the rest. Record videos of 720pixels at 30 frames per second, and take stunning selfies with the 5MP selfie camera. The selfie camera comes with a front flash beside it for late night selfies or video calls. The Geecoo G1 houses a 3000mAh Non-removable Li-Po battery with fast charging technology support. It should take close to 2.5 hours to fully charge the device from 0% to 100%. 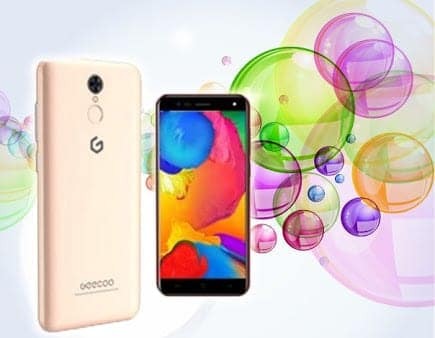 What is Geecoo G1 Price and Availability Status? The Geecoo G1 is available on Shopping stores from $89 (N25,000) to $109 (N40,000).